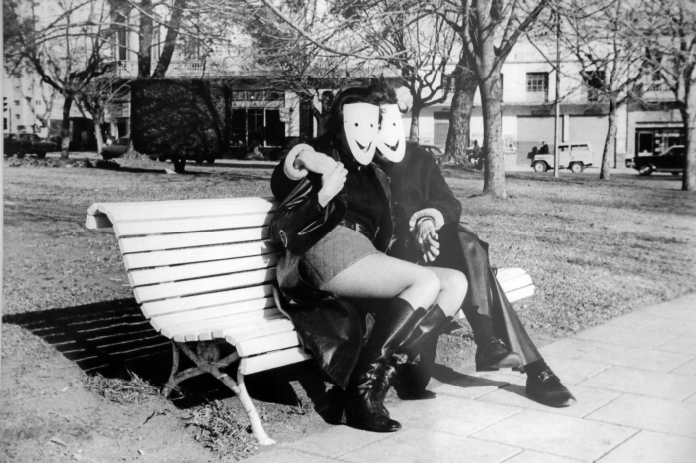 Argentinian artist, born in 1940, Luis Pazos transitioned from an experimental poetry and editing practice to the creation of actions and happenings in the 1970s. Pazos uses the human body with the intention of questioning evolving political ideologies. The artist reports and examines the history of Argentina, a country that has suffered years of instability and dictatorship from the late 1960s. In his work Tranformaciones de masas en vivo (1973), he gives instructions to the audience who thus become living sculptures, transforming bodies into geometric shapes, evoking military enlistments as well as resistance forces. Political ideologies condition the social body and individual bodies.